The creed concludes by directing our attention to our own end: we ‘look forward to the resurrection of the dead and the life of the world to come’. Maybe by the time we get to the last line, our attention has moved on to the next part of the Mass, or even to what’s for Sunday lunch. Or maybe the repetition week by week has dulled our perception of its oddity. The resurrection of the dead? The life of the world to come? 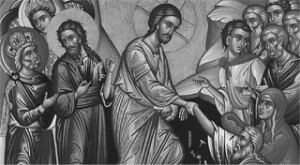 However often we say these things, and however much we might know about the Church’s teaching on resurrection and new life, the future remains ultimately mysterious: we believe, but we do not grasp these things. Yet remembering our end is of critical importance: even the New York Times advises us to do so. In a recent article Arthur Brooks advised readers to bear their death in mind in order to live a more fulfilling life. (This week our mortality has been brought into incredibly sharp focus, too, by the deaths of David Bowie and Alan Rickman.) Rather than making us more gloomy, he says, remembering the transitory nature of our life heightens our capacity for humour and joy. Not only that: Brooks suggests that concentrating on the ‘scarcity of time’ can help us to choose our pastimes more consciously, focusing on those things that bring real satisfaction (and those listed include prayer and worship) over those that merely distract us. The op-ed section isn’t the place I would usually turn for spiritual guidance. In this case, though, Brooks points to something we ought to know: that growth in our spiritual life requires a form of attention that directs us to our ultimate end. For his readers, death is the end. We look forward to something else: the resurrection of the dead, and the life of the world to come. Contemplating this mystery forms a crucial part of the practice of Christian life, and bathes our ordinary experience in everlasting light.